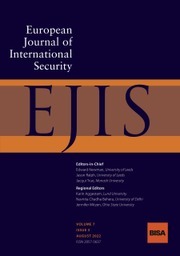 The European Journal of International Security (EJIS) publishes theoretical, methodological and empirical papers at the cutting-edge of security research. Welcoming high quality research from around the world, EJIS covers all areas of international security, including: conflict and peacebuilding; strategy and warfare; environmental and food security; economic and energy security; human and everyday security; technology and security; and security governance. The journal is particularly concerned to make connections and build bridges, both between different disciplinary and theoretical perspectives, but also across regional boundaries.